While my next marathon is in October (Portland,) this weekend's Georgetown to Idaho Springs (GTIS) was a "circle the calendar" race for me for a number of reasons; 1) A shorter race a month or two before your "big race" is a good litmus test on how your training is coming along and perhaps an indicator of what your race day might hold, 2) I have been anxious to see the impact of heart rate based training in a race and planned to run with a heart rate monitor in a race for the first time, 3) I had run GTIS two years before and really enjoyed the race and 4) it was the same weekend as my high school reunion so the whole weekend was full of festive activities. 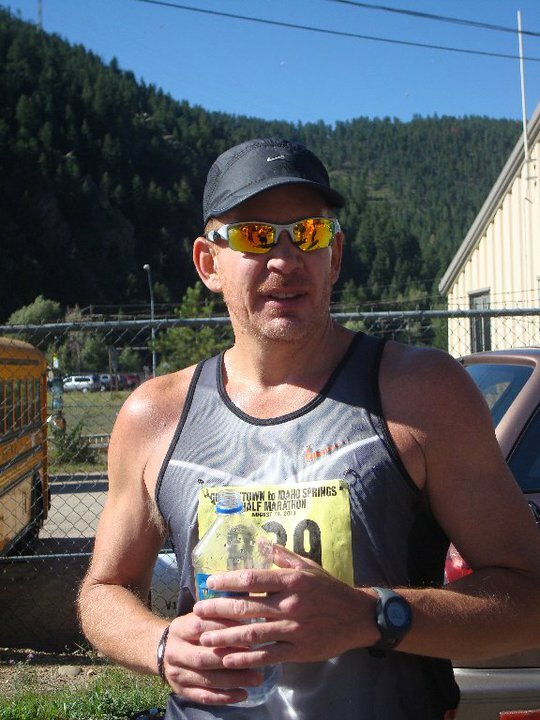 During the week, my running coach, David Manthey asked our running group, Runner's Edge of the Rockies what everyone's goal was for the race. My previous PR was in the Denver (Half) Marathon in 2009 with a 1:37 time. I normally set two goals going into a race; a reasonable goal I should likely hit and a "stretch goal" which would push me. Being somewhat superstitious, I don't normally share my goals until the night before. Ironically, many of my good friends from high school including my best friend, Jim ran high school cross country. If you've followed my blog history, you know I'm a bit of a Forrest Gump that stumbled into running in my adult life so I was not on the cross country team in High School, but found myself telling running war stories at our mixer event Friday night at the reunion and was forced to publically share my "stretch goal." My goal for the race was to PR and stretch goal was to qualify for the New York Marathon. As many of you are aware, New York has qualification times to guarantee entry into their marathon and perhaps trying to "one up" the Boston Marathon, their qualification times are slightly tougher to hit than the Boston Athletic Association's standards. They also have half marathon qualification times--at my age, that's a 1:30 half or slightly faster than a seven minute mile pace. For my second race in a row (Steamboat same deal) I came down with a Tuesday flu bug (stomach, body aches, fatigue.) My wife is beginning to wonder if it's nerves or psychosomatic (had to look up the spelling on that one on Google.) Leading up to race week, I've felt better than I have in a long time which I attribute to my discipline around heart rate training and more importantly, sticking to the schedule--recovering on recovery days, and easing off the gas pedal on Zone 1/2 (lower heart rate) scheduled runs. Despite the Friday night High School reunion temptations of staying up late with old high school chums until the wee hours of the morning, I was a "good boy" and was in bed before 10. Prior to going out Friday night, I'd laid out all the race day gear and prepped for the race. My race bag had; warm clothes for pre-race on the cold mountainside, my lighter weight racing shoes, body glide, brand new smart wool socks, Amphipod belt w/ Shot Bloks, new Garmin 110 with heart rate strap, and bib (with built-in timing chip--a first for GTIS and me) pinned on one of my favorite Meb singlets. Awaking Saturday morning I was hoping for a small health miracle, but I could tell that my body was still sluggish from three days of a bug. I noticed a midnight text from my buddy Jim (cross country High school friend) who we'd nicknamed "Ty's Agent" the night before. The text read, "Race Day! Clear the mind. Uvd trained hard - ur ready - this is it! Get in the ZONE! 1:28:49." After a quick Lara Bar, rolling out my legs and back on my foam roller, and loading some water, I spent an "above average" amount of time in the bathroom and wrestled with the two imaginary 3" holograms hovering over opposing shoulders. One hologram was my mom with a thermometer wagging at me to "get back to bed young man, there's no way you are racing today!" The other was my agent, "you call yourself a runner?! Get off that stool and get up that mountain you big p**sy...you've got a race to run!" I decided to make a "game time" decision, so off I went with my race gear for the 45 minute drive up the mountain to Idaho Springs. Idaho Springs is a cool little mountain town hugging the I-70 corridor running up to all of what Colorado has to offer in the winter and summer. The good news is that the course is downhill, and the bad news is that the course is downhill. As coach Dave informed us, your body can take 30% more pounding on a downhill course vs. flat course. The weather was absolutely perfect with the sun out and cool temps at start time. The course meanders through a two mile loop in Georgetown before it parallels I-70 heading East towards Idaho Springs. A good majority of the road was frontage road with parts of the asphalt suffering from the extreme Colorado weather which left some minor potholes. As a result, I found myself looking down a lot more than normal. There was one stretch coming out of Georgetown that was newly paved which was nice and spongy and another stretch that ran along a trail. Only problem with the trail was that it appeared to have a fresh layer of soft dirt which felt like running on sand (or snow) and kicked up quite a bit of a cloud from the thundering herd of runners. This was the first time I've raced with a Heart Rate monitor and while I mainly kept track of pace, I would occasionally check into what my heart rate was which provided positive reinforcement mentally that I was largely in Zone 3/4 of my heart rate. We had a bit of a headwind, but otherwise the conditions were great. I have never been one for negative splits, so my race strategy was even splits, but clearly came out a bit quick. Probably because it was only a 1/2 marathon, I really did not feel the stress on my quads, but seemed to have my energy wane around miles 8 and 12. While the chart looks like it is straight downhill, there are a few "rollers" along the course. The other in-race experiment for me was using my Hydrapouch as they had Gatorade and water barrels with a hydrapouch spout. Overall, that worked out pretty good except my right arm and leg was one sticky mess with the fill process. 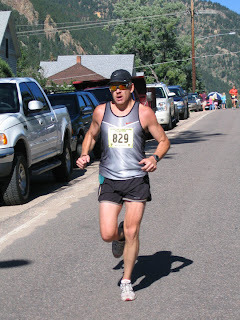 Coming into Idaho Springs, there's a bit of a hill (but nothing compared to Steam boat, Boston, or some of coach Dave's killer training hills,) so I shortened my stride and it didn't seem to impact me much at all. The coolest part of the race was coming into town and starting to see more spectators. 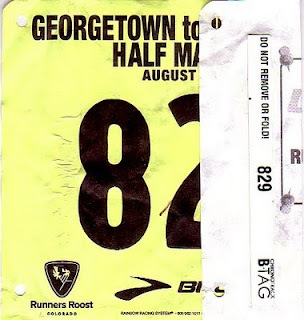 While there were a number along the course sprinkled like mountain goats staring at the strange creatures flying down the mountain, the crowd cheering in town really started to help my pace. Coach Dave who captured a pic of me coming into town also belted out encouragement for me to "push it" as I was in the final stretch. I flew into the finish line far stronger than any recent race at a sprint and was pleased to see my family cheering me on across the finish. Just like Steamboat, I feel great about the outcome of this race considering I nearly pulled out before and during the race. I am very pleased with the time and even more pleased with how my heart rate behaved below lactate thres hold. The downhill meant my body and feet took a pounding and have the blisters and a toenail that's a "goner" to prove it. Note to self--more BodyGlide next time on the downhill course. The post race celebration was on the High School grass football field and I enjoyed the banana, yogurt, and bagel with my wife and fellow runners David (the jackrabbit that I try and catch on my long group runs,) and Erin. A good litmus test indeed for my next big race; the Portland Marathon in October. The next month is increased long run miles, some speed/track work before my three week taper. My Garmin finish time was 1:32:43. Another Maxwell Smart run..."missed it by that much." Can't imagine running a half at that altitude. 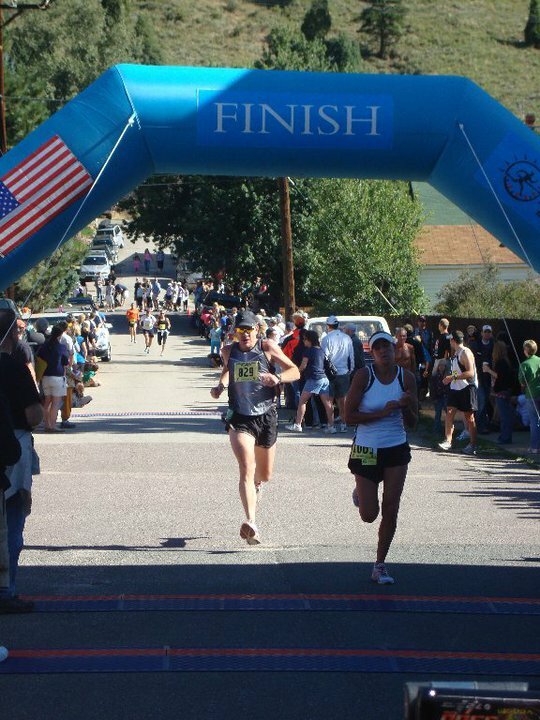 My first high altitude race, while living in NYC, was the Bolder Boulder, where a heart monitor where I hit 201!!! My favorite half in tuning up for the NYC Marathon was the Philidelphia Distance Run, probably the fastest half ever, PR'd every year. Perfect time for a check up on your training for a Fall Marathon.